We guarantee that we’ll listen to what you want - because it’s your day. Our photographers will work quickly and with the minimum of ‘fuss’. 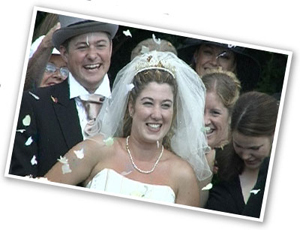 We’ll film using 2 camera film operators - for front and back of ceremony, speeches with reactions ... and more natural moments filmed from a discreet distance! We’ll use professional but discreet microphones for crystal clear sound quality in the ceremony and speeches. We’ll work together with your photographer and liaise with your priest / minister for a smooth running day. We’ll never leave your wedding to film another event! We’ll bring back-up cameras for your peace of mind. We’ll edit your film to our highest standards (50-70 hours) for a truly movie quality result. We provide full public liability and professional indemnity insurance. In the unlikely event of a faulty DVD it would be replaced free of charge. Our apologies that you won't see much of us on the day. We'll have plenty of footage and your guests will appreciate our unobtrusive filming style! Jon and Karrie are members of professional associations with years of experience in the wedding and event industry.